© 1988 Iron Maiden LLP. ℗ 1988 the copyright in the original sound recording is owned by Parlophone Records Ltd., A Warner Music Group Company. © 1988 Iron Maiden LLP. © 2014 Parlophone Records Ltd. Made in the EU. ℗ 1988 the copyright in this sound recording is owned by Parlophone Records Ltd., a Warner Music Group Company. © 1988 Iron Maiden LLP. Issued with original artwork, including printed inner sleeve with lyrics and credits. / 180 Gram. I've listened to this reissue over and over (probably because it's my favorite album), and I have compared it to other issues. The result is this one is very very solid sounding. Excellent bass, guitar solos are crisp, and a Bruce sounds amazing. My recommendation> Add this copy to your collection! 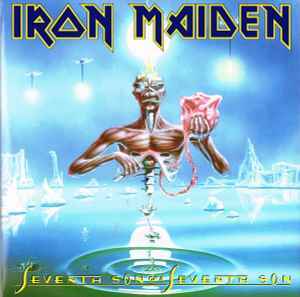 From all Maiden's reissues, this one wins the first place for the most pixelated of the lot. They really messed up here, the original cover always looked a bit tame in my opinion, and obviously not as detailed as other Riggs's artworks, but the scan they used for this reissue looks rather bad and blurry... Really not great. I had a strange problem with this album. First one I bought looked almost used and dusty, and had awful cracklings all over. It sounded like VG second-hand copy. Absolutely incredible. I decided to bring it back to my local store and ask for a replacement, the other copy (still the one I have), sounded much better, still noisy with occasional crackling but not disturbing anymore. From all Maiden's reissues I own, this one is the most noisy of the lot, yet nothing really awful. Soundwise, it's pretty fine, they used the original masters for these reissues and did a proper vinyl mastering, and you can tell it easily. I can't compare it to the original unfortunately but I have no doubt it's certainly better, still, this copy is far from bad to me. If you want a mint copy of this album go for this one, otherwise, look for an original, but for a decent price, this is a pretty good deal. one of maiden's best albums but this reissue sounds very dull and lifeless when compared to the original pressing .